Looking for Home Services? Need to find contractors for drywall? If you’re needing nail hole repairs or major holes repaired we offer affordable wall repair services for major or minor repairs. Let’s face it, no one enjoys looking at nail holes, stress cracks, or small holes in the wall. Maybe you have removed wallpaper recently and you have remaining wallpaper glue. We can help you no matter repair your wall damage! 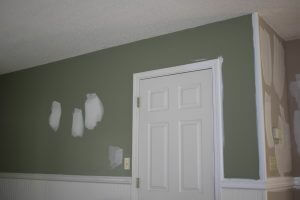 We patch small and large holes given your walls a smooth new look.